Over the past week, I lettered a quote from John Greenleaf Whittier on 30 glasses which were given as gifts to participants in the Celebrating Whittier event sponsored by the Whittier Home Association in Amesbury, MA. My involvement began last spring when I wrote Take joy! on a vase for Books in Bloom at the Newburyport Public Library. I used acrylic paint which was not a good idea as it was starting to peel before it even got to the library. 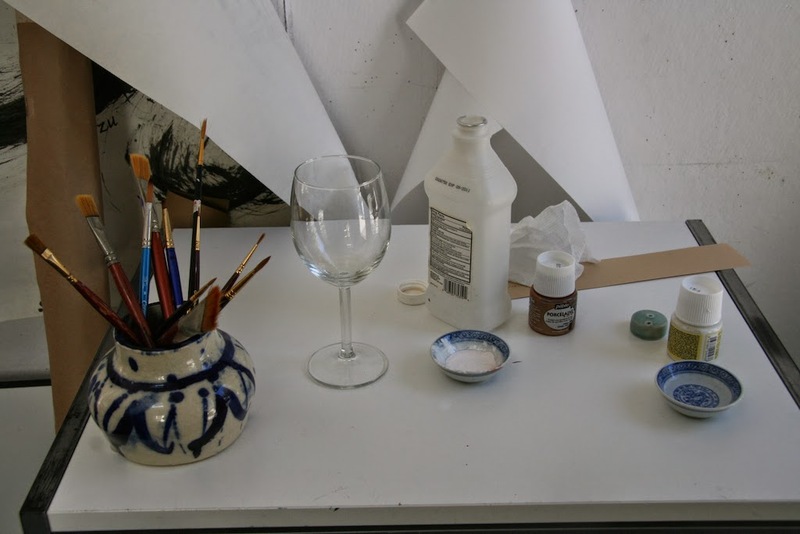 That led me to research glass paint and I discovered Pebeo Porcelaine. 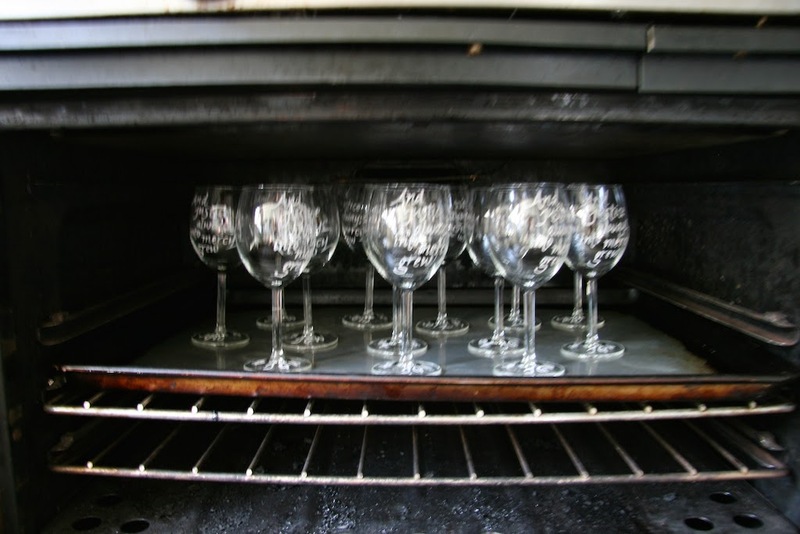 The great thing about it is that it can be wiped off even after it dries (rubbing alcohol works better than water) but is made permanent by baking for 35 minutes in a 300 degree oven. Last year I had designed a booklet for the Whittier event so this year I thought a quote lettered on glass would be a nice addition to the evening. We originally contemplated vases but eventually decided on wine glasses. 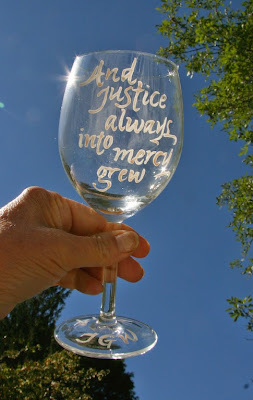 I had a selection of quotes from the Whispered Fragments piece I had done at Outdoor Sculpture at Maudslay and "And justice always into mercy grew" from Whittier's 1872 The Pennsylvania Pilgrim was chosen. 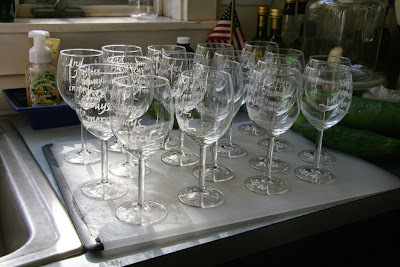 By the time I finished writing on the glasses, I was pretty discouraged. I found it difficult to get the paint on as evenly as I would have liked and working on the curved surface was a challenge. As I put them in the boxes, I could see nothing but the flaws and cheered myself with the thought that the recipients probably wouldn't know enough about calligraphy to see what I saw. And then a funny thing happened at the program last night. I saw a few of them outside of the studio and in the hall after a wonderful evening of presentations. They looked great! Somehow they had absorbed the rush of good feeling in the air after an inspiring evening of Whittier's words about social justice and the experiences of the abolitionist and feminist Grimke sisters as portrayed by Susan Lenoe and Lani Peterson. 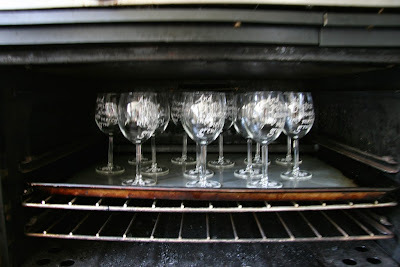 I knew I would be writing a post about the glasses today. Before last night, it would have concluded with the decision to avoid projects that involved direct lettering as opposed to work that is reproduced. Calligraphy and lettering are no longer the basis of my work but most often an element of it. I could spend time learning more about controlling the paint and writing on glass. I could work at it until I could work with the freedom and looseness that I can with my brush pen on paper. But I don't want to. It has taken me many years to give myself permission to work in the way that I want. If I feel that if I can do work that fits the standards of the overall piece and its use, that is okay even if it is not the best I could do if I worked harder at it. I'm coming to see that I will never live long enough to learn everything I could learn or pursue every idea that I have. 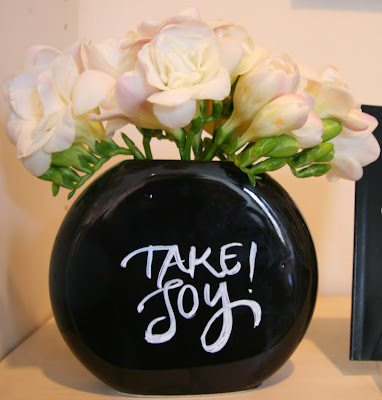 It's time, as I wrote in Art Lessons, to "Take joy!" and also to accept that I can give joy. I know that the glasses are of value for both the message of the quote and the way it was presented to some if not all of the recipients. Sometimes it's not just about me. Thank you Susan, this post is rich in layered lessons. All about acceptance, time, learning, and taking joy in the moment at hand. I love it all!